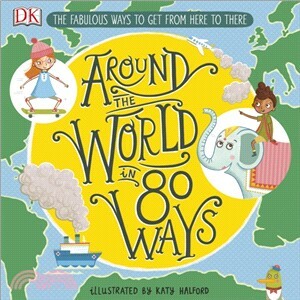 A fascinating and engaging picture book exploring 80 exciting ways to travel, both past and present - from the obvious, to the crazy! Travel around the world by yacht, tram, train, unicycle, jetpack, camel... any way you can imagine, in this non-fiction children's book. Every mode of transport is part of a charming scene. See how astronauts travel around space, watch surfers ride the waves at the beach, and race to an emergency with the firefighters. Illustrator Katy Halford's beautiful drawings brings the scenes to life and fun complementary facts will prompt discussion and laughter between readers. How would you choose to travel? Donkey, pedalo, moon buggy? From the small to the big, the familiar to obscure, take your pick from the amazing 80 shown in DK's Around the World in 80 Ways!